Monetize videos Youku: By joining the Sharing Plan, you can start to monetize your videos. This means Youku will play ads on your videos for 30 seconds and as reward will give you money for that. The More viewer you get, the bigger your earnings. You might want to read why you should monetize on Youku. 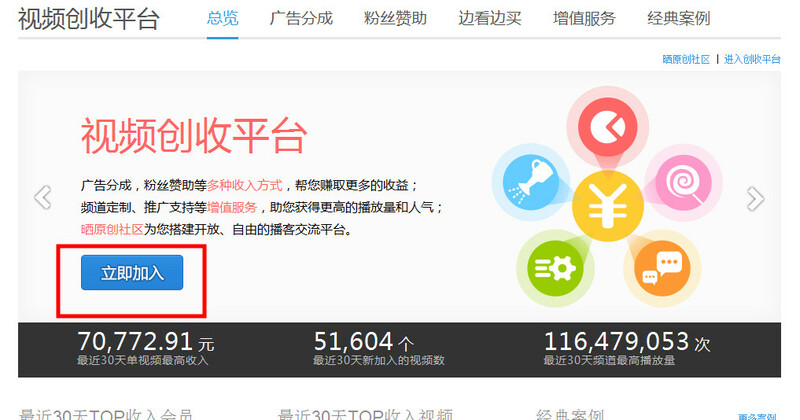 Or to have content to monetize, you might want to create an account on Youku or start uploading videos. To start click like the image below to start the Sharing Plan. Since your total number of videos and video playback than the smaller , temporary video revenue does not meet the requirements to join the sharing platform. Unfortunately they are vague about the amount of views are required to join the platform. This site doesn’t have further information. This means you have to wait to gain more audience to your videos before you can monetize your videos. The next steps will be: You need to fill out a form about personal information. They do send the money straight to your bank account in your country. When you provided them the personal informatie, you could add bank account, swift IBAN and so on. You can choose which videos you want to monetize.